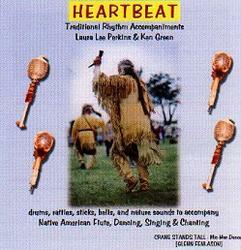 Laura Lee Perkins and Ken Green: "Heartbeat", Traditional Rhythm Accompaniments ... This recording has 15 selections, each three minutes long to play your flute to. A collection of drums, rattles, sticks, bells and nature sounds to accompany your flute playing. Profides an underlying pulse to serve as the HEARTBEAT OF THE MUSIC. Play along with a flute in any key and create your own magical song. "Ata- Kili ('totally awesome' in Lakota). The Oregon Flute Quiver offers the perfect protection for my treasured flutes."